After college, Clay Jannon worked as a designer for a San Francisco start up that aimed to create the mathematically perfect bagel. But when the recession drives NewBagel out of business, Clay finds himself out of work. Wandering the streets of San Francisco, he discovers a peculiar, three-storey tall bookshop that is open 24 hours a days, and accepts the position of night clerk at this unconventional establishment. The main qualification for this new job is the ability to climb a ladder. The customers on the ten-to-six shift are few and far between, and those that do come in are exceedingly peculiar. Mr. Penumbra, the owner of the book shop, keeps a special collection of books, which Clay is forbidden to look into, which are not sold, but rather loaned to these special patrons, and recorded in detail in a log book. Bored and curious, Clay designs a 3D model of the store that tracks the loans, and in doing so, accidentally discovers the centuries-old secret of the Unbroken Spine. With the help of his Googler girlfriend, Kat, and his tech-genius best friend, Neel, Clay turns the power of the digital age on a mystery that has puzzled scholars for centuries. Imagine accidentally solving the Da Vinci code with a computer program and a sense of humour. Clay’s efforts to entertain himself on the night shift cause him to stumble over a secret society right under his nose, complete with coded manuscripts, and a mysterious founder who supposedly achieved immortality. If that sounds a little bit cheesy, it is because, to some extent this book is a parody of the fantasy quest, or the code-breaking mystery; Clay makes many joking references to wizards, rogues, and warriors, and is skeptical of the mystery of the Unbroken Spine, even as he finds himself obsessed with it. Robin Sloan includes and uses much of the modern technology that can make mysteries a little too easily solved, from cell phones to Google, and riffs on that simplicity. “Stuff that used to be hard just isn’t hard anymore,” when you have things like Hadoop and Mechanical Turk at your fingertips. Expecting this comedic aspect of the story is important, because otherwise it might seem a bit light and fluffy for a mystery or thriller. 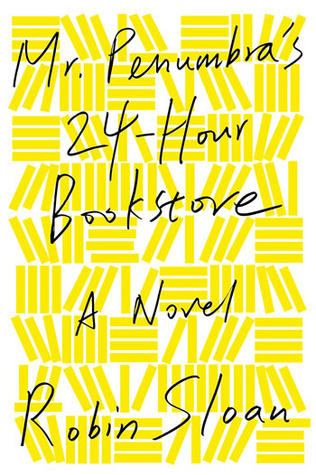 Set in an independent book shop in Silicon Valley, Mr. Penumbra’s 24-Hour Bookstore embodies many of society’s current anxieties about the role of books and reading in the digital age. But rather than pitting the e-book against the codex, and flogging that dead horse some more, Sloan shows digital and manual technologies working alongside one another, one picking up where the other falls short. Although Clay might never have cracked the case on his own, he is at the epicentre of a group of people who have the varied knowledge and skills needed to solve the peculiar puzzle of Mr. Penumbra’s 24-Hour Bookstore. The current and specific technological references to Google, Apple, Twitter and more may give this book a limited shelf life, but it is a perfect read here and now, and one with the unusual potential to delight computer nerds and book lovers alike. After enjoying The Word Exchange so much, I’m definitely excited to read more books about the role that technology and books play in our lives. This sounds very good!